Adds 8 Tally relay contacts to any ATEM switcher. With 8 contact closure tally outputs, you can send a tally signal to your cameras, replay machines and monitors so everyone knows which camera is 'on-air'! Now you can position your cameras a long distance away from your switcher and get closer to the action with ATEM Camera and Studio Converters. There are two ATEM converters for use at opposite ends of a live camera connection! ATEM Camera Converter converts your camera’s SDI or HDMI output to optical fiber, with embedded external audio and talkback from the camera position. The machined aluminum design is lightweight, strong and includes an internal long life battery for increased portability. ATEM Studio Converter’s rack mount design has 4 bi-directional optical fiber connections so you can connect multiple camera converters and convert the optical fiber input to SDI and de-embed audio using XLR connections. 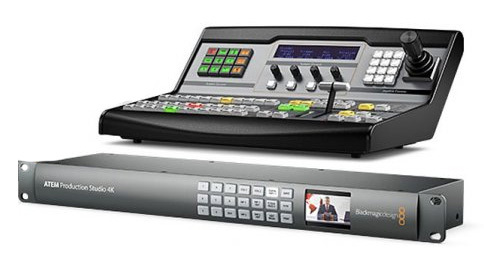 The panel for Blackmagic Design Studio Converter: connects to Blackmagic Design ATEM Studio Converter. Panel One is a 19" 1RU panel, equipped with four FieldCast 2Core SM Chassis Connectors, ideal for using FieldCast cable in conjunction with Blackmagic Design Studio Converter. Power Panel for ATEM Studio Converter with 4x FieldCast 2Core SM chassis connectors to ATEM Studio Converter.